“The game isn’t going to tell you if you got that right.” It’s an ominous way to start a game demo, but one I’m not too surprised by after playing 80 Days and Sorcery! 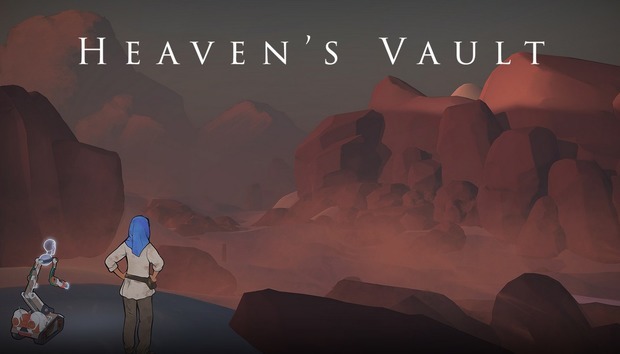 Heaven’s Vault is Inkle’s new game, and I met up with studio co-founders Jon Ingold and Joseph Humfrey recently to get some hands-on time. At first glance it’s a huge step away from Inkle’s previous games—where 80 Days and Sorcery mostly played out in text, Heaven’s Vault features fully navigable 3D environments. And so you get this weird hybrid, which Ingold compares briefly to The Last Express before subsequently dismissing his own comparison. It’s unique—really and actually unique, I think. In all my years playing games I haven’t seen anything quite like it, at least. Not that there’s much to look at, at the moment. The demo takes place on a dusty red planet, Mars-like except dotted with ancient ruins and marker stones. Like Inkle’s other games, Heaven’s Vault relies heavily on travel and exploration, but this time it’s through space, back and forth to planets hidden within a colorful nebula. So why this planet? The ruins have something to do with it. I’ve been sent here by a university to reclaim some sort of artifact—though what it is I’m looking for, I have no idea. Which brings us back to the opening: “The game isn’t going to tell you if you got that right.” That was Ingold speaking, and it was in regard to one of the game’s overarching mysteries—a lost language. One of your tasks as a space archaeologist will be translating this lost language’s symbols into something usable. Like, actually translating it. In our first example, we come upon a signpost and deduce that the symbol means either “Port” or “Temple.” Looking around at the dusty ruins around me, not even a rowboat in sight, I opt for “Temple.” Writing this article now, I’m about 90 percent sure I got it right—but the game never told me one way or the other. Nor would it tell me if I got it wrong. Most (or maybe all) of this translation work is optional for the player, but “If you really get into it, you might have a dictionary of 300 or 400 words of which maybe half, maybe slightly more, you can’t be certain if they’re right,” says Ingold. And yes, this means that you can compound your own mistakes, make assumptions based on prior assumptions that were themselves false, thus ruining an entire branch of your translations. Not that you’d ever know. The game doesn’t leave you wholly stranded. Inkle’s engine keeps track of what the player knows, what words would be pertinent to the current situation, so it’s not quite like finding a scrap of text in the desert and having no idea where to start. “The great thing about the Ink Engine is that it just remembers everything you do all the time,” says Ingold, “and it’s very easy to call back to anything. That’s how we do this ‘Lots of little choices, all of which can be significant at any given moment,’ because we’re just tracking everything. “We’ve done this before, in Sorcery. No one ever notices it, which is great, but when you talk to people in Sorcery they always tell you a useful piece of information. It’s because the game knows what you know and it makes sure they do,” he finishes. Anyway, I opt for temple and this starts us off on a journey across barren red sand dunes. Occasionally we stop and talk with our robot companion, Six. “At any time you can start a conversation with your robot and it’ll be about whatever you’re doing in the moment,” says Humfrey. It’s very 80 Days-esque in that respect, with Six questioning my translations and commenting on our surroundings. Soon we start clambering up a mountain, and Aliya gets winded. There’s a stamina meter in place for attempting difficult actions—Inkle’s resource management for Heaven’s Vault. Become too exhausted and you’ll faint, at which point Six will airlift you off the planet and refuse to let you back. He’s right. That feeling you get when you almost turned right instead of left, when you found something you’re convinced only a fraction of other players saw—that’s an all-too-rare experience. Hell, it’s anathema to modern design. Picture your average open-world map, littered with icons because perish the thought the player misses a single dungeon, skips a single side quest. That hand-holding approach kills discovery, makes the world feel artificial, reveals the hand of the designer placing objects and missions just so for the player to check off a list. “But what’s exciting now is...yeah, maybe we can do both.” That’s the goal with Heaven’s Vault—to tell the same sort of story as 80 Days or Sorcery but in a more visual environment, to keep the same level of player influence on the world but make those worlds more concrete and fully-realized, to let the player fail and not make it feel like failure. “Telling a good story where everything that happens in the story is part of what the player did and part of the experience,” as Ingold puts it. We make it to the top of the mountain to find a grander complex of ruins and, amidst it, an enormous sealed door. I pry it open, and the demo ends—just enough here to pique my interest, of course. Look for Heaven’s Vault sometime in the semi-distant future—2018 at the earliest, probably. I’ve no idea how the full game will play, nor what else I’ll be doing besides translating an alien language, but I’m ready to find out. Inkle doing Star Trek-style science fiction, emphasizing exploration of a vast and uncaring universe? Make it so.